I call this my Blue Figgy. Once upon a time we were waiting for our turn to have a home of our own. We were renters, first in the TreeHouse, where the children slept in the kitchen-living room-dining room, and where we cooked in the summer and froze in the winter. It is also where we met Tamsyn, and the children climbed the rubber tree and made apple pies. Then we were in Garage Mahal, a stucco palace with faux columns and a landlord that pulled up our flowers, and imposed his meddlesome self. Half the yard would flood, and seep in to the house, and the plumbing was equally vexing. But. Well. It had enough room for beds and chairs, and eventually we defied reason and squeezed in a hen or two. And all the while the world felt compelled to preach to us about how silly we were to rent, when we could just bite the bubble bullet and buy! *Easy credit! Drink the kool-aid, jump in, the water is fine! * We waited. We endured. We got depressed. We got angry. We got ripped off. And sometimes I let it show a bit. And sometimes I really let it all hang out. Then last May, a house that we had been watching for a few years came on the market again. For too much money. Then they dropped the price, so we dared ourselves to hope, and we stopped by the open house. A fig tree was growing in the yard. That morning, before we left to run errands I promised the children that we were going to "buy a fig tree, even if it has to live in a barrel for a year." And here I was at this big, beautiful home, with a yard and garage, on a favorite street, and there was a fig tree. A sign? 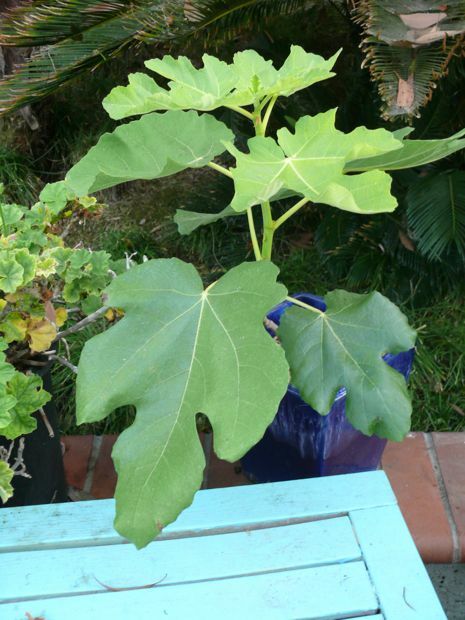 Did you know that small sucker branches that grow at the base of a fig tree can be pulled up and transplanted? They will easily grow in to a whole new tree. Of course I am only speaking hypothetically: It would be inappropriate to go to an open house, pull up a tree branch, hide it under your coat and take it home. I know that. It would be embarrassing to admit to such an act, to beam proudly about growing such a tree and then eventually owning the mother tree too. Hmmm. I know of a blogger who is trying to buy her own home. A pretty little place, where she can keep chickens, where a fig tree is growing. And she is in the middle of the forty-two levels of housing-realtor-banking-mortgage-escrow h.e.l.l. My heart goes out to her. It took us from May through September to finalize the purchase of the Bird House, and we visited every single level of that h.e.l.l. It is a nightmare, that I cannot, and will not, reflect on too deeply, because it still hurts too much. Sometimes, when I am leaving our driveway, or when I look out the window from the kitchen, I cry. I am home. It is a pretty home, where we have room for beds, chairs, and chickens, and where one now three! fig trees are growing. My appreciation, gratitude, and joy are overwhelming. Even the dents and dings, the leaks, make me kind of giddy... they are our very own dents, dings, and leaks. And these are our figs. They are plumper and sweeter this year, and even more of them are growing on the mama tree. And the Blue Figgy is in the ground, getting tall, leafing out. And the very sad looking, stick of a fig tree I planted in February, is healthy and green. This is the new chapter in our story, and I have learned there are no guarantees, that we cannot be sure of happy endings... but right now, here... this is pretty good. I wish that everyone could enjoy their very own pretty good. Wow, this made me think of our own recent adventure in the "buying a house roller coaster." The seller was such a jerk that he cursed out his own agent...she was really nice to us. If it hadn't been for our agent, we would have walked away. It is wonderful to own your own "dents, dings, and leaks." Congrats on the figs! 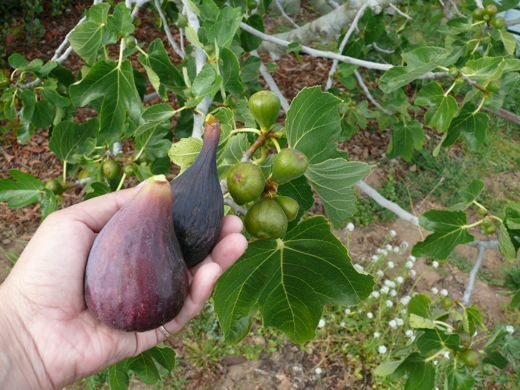 I love figs ... prunes ... do you know if they will grow in Oregon? Mmmm - yummy-looking figs, you lucky thing! Thank you for reminding me today that *pretty good* is very often *good enough*. 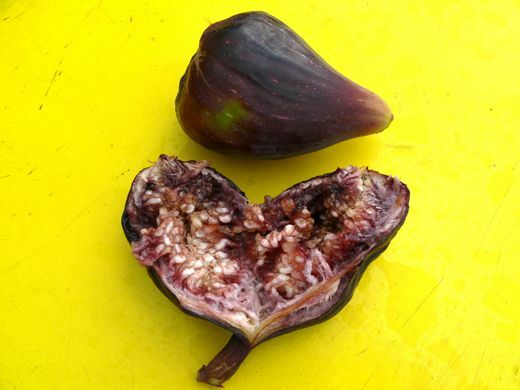 Not a fig fan particularly, but I adore them today. Thanks!